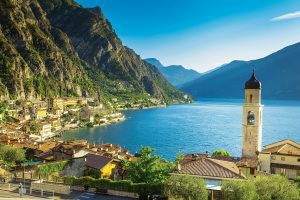 Famous as the border between the “boot” and Switzerland, situated at the foot of the Italian Alps, with crystal blue water and crumbling ruins – for a long time Lake Garda is a popular holiday destination. One of Lake Garda’s most picturesque towns is Sirmione, which pre-dates the Roman era and contains a 13th century fortified stronghold, Scaliger castle, that looks out on to the lake. Only around 150 people live in the old town, which is dominated by narrow, cobbled streets, tourist shops and restaurants. 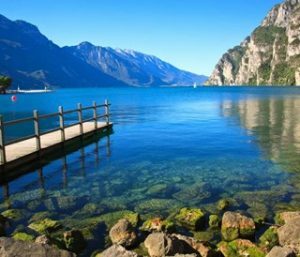 One of the best places to stay during your vacation is Villa Lugana Marina – close to the shore of Lake Garda, is situated in a peaceful location surrounded by a green and shady garden. The complex is just 4 km from the historic centre of the beautiful town of Sirmione. The bungalows are 32 – suitable for couples and families with children because it offers apartments for all requirements: 1, 2, and 3-room apartments, tastefully furnished with a fully equipped kitchen, private bathroom, flat-screen TV with SKY channels, balcony or patio, safe. It also overlooks a spacious outdoor pool for children and adults and has a half-moon pool specially designed for small children. Sirmione’s most famous landmark is the crumbling ruins of Grottoes of Catullus, which was a grand Roman villa in 1st century BC. The ruins are set in a serene backdrop of olive groves and rosemary bushes, overlooking the translucent waters of Lake Garda.